There is plenty of shopping opportunities when you visit Vancouver and much of the fun is looking for the perfect Vancouver souvenir as a memento of your visit to Canada’s west coast! Or between all of the things to do in Vancouver, maybe you want to buy the perfect Vancouver gifts to bring home to your friends or family! Whatever inspires your shopping there are plenty of things to buy in Vancouver that will achieve just that! And beyond shopping, Vancouver’s multicultural make up means that there are plenty of unique shopping experiences from the annual summer Richmond night market, to little India shopping and the well known Granville Island in Vancouver. After reading this guide all you will need to do is keep your eyes open for the unique Vancouver souvenirs you want to buy and grab them when you see them! The worst is when you are not sure what you want to buy and then have to double back and go pick it up! Especially if you only have a short time to enjoy the city! But do not worry, keep reading and you are ahead of the game, before you even start your souvenir shopping in Vancouver you will have some great ideas on the best things to buy in Vancouver on your Canadian travels! British Columbia has dozens of wineries and quite a few tasting rooms outside of the city. If you have time to explore Metro Vancouver you can visit them, but if you do not, walk into a liquor store and check out the huge selection of BC wines available. This is something you can always grab at the Duty Free if you are flying out of YVR. Vancouver has two big chocolate brands, Rogers Chocolates and Purdy’s Chocolates! Purdy’s is my personal favorite and makes a great gift to bring home to your friends and family! I personally recommend the white chocolate or the tiger butter! Rogers chocolates originated in nearby Victoria in the 1800s and is still owned by local Canadians today! Purdy’s chocolates started right in downtown Vancouver in 1907 and still maintains a small family ownership model. Vancity Original Brand has been on the streets of Vancouver since 1998 and it makes the perfect Vancouver souvenir to bring home from your visit! It has become the staple brand for Vancouverites, international tourists, and fashion forward consumers. Despite what seems like dryer winters and hot dry summers, Vancouver receives a lot of rain! Grab yourself an umbrella while you are in the city as a momento of your visit! If the rainy weather is getting to you, check out things to do in Vancouver in the rain with kids! The Vancouver Canucks are the hockey team that the city loves and loves to hate. Vancouverites love cheering for a winning team and are the first to stop buying tickets when their team is in a slump. But win or lose, Vancouver is full of Canucks gear and a souvenir that says “VANCOUVER” would be some Vancouver Canucks gear! A staple in the diet of the Indigenous peoples, salmon is something you should enjoy while in Vancouver. And with the portability of smoked salmon, it makes an excellent gift from Vancouver to bring home to your friends. Try the candied one if you get a chance, its one of my favorites. You can buy smoked salmon in gift shops, grocery stores, Costco and the Duty Free shops! 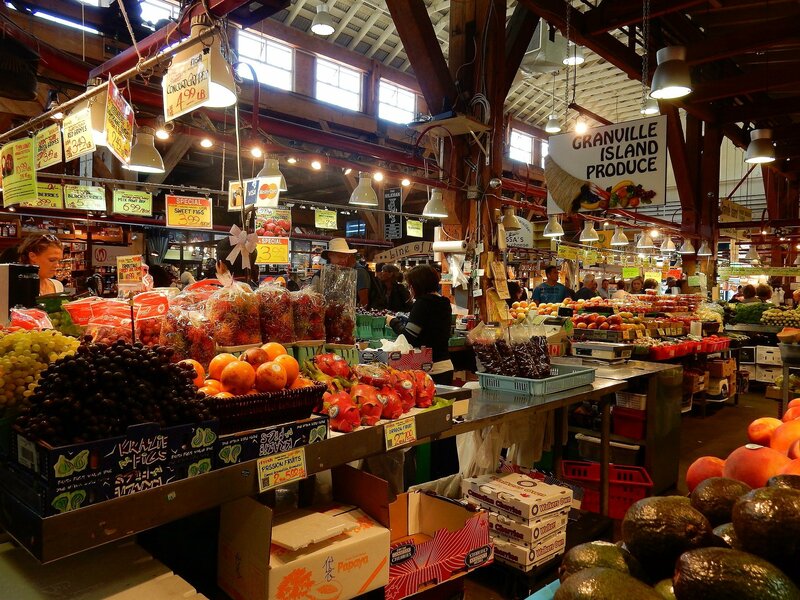 You can also find it in local markets and places like Granville Island. 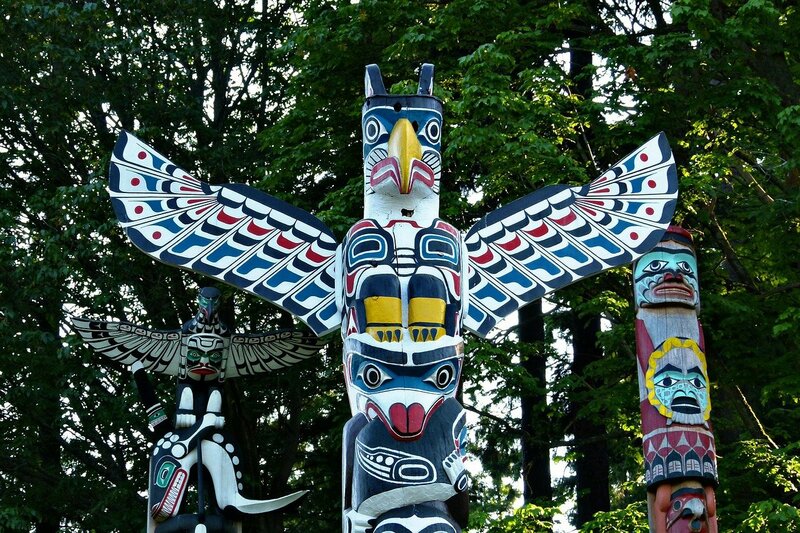 There are hundreds of incredibly talented Indigenous artists that live and work in the Vancouver area. Growing up outside the city, I have been lucky enough to know a few of them and have seen their artwork in studios, as coveted jewelry and as giant art pieces on buildings. Small markets will have local art and so will gift shops. You can even find some beautiful pieces on places like the BC Ferries if you are going to Vancouver to Victoria. Vancouver’s culinary scene has been partly shaped by the chefs who call the city home. As chefs have turned into celebrities, so too have their dishes. Whether you check out Vikram Vij’s restarurants or his take home dishes and cookbooks, or Iron Chef Rob Feenie’s creations at Cactus Club, if you are a foodie and in Vancouver, you should bring some of Vancouver’s food scene home with you! Check out Vikram Vij’s cookbooks here or Rob Feenie’s here. Maple fudge makes a great Vancouver souvenir and one of the best places to get it is from Rocky Mountain Chocolate Factory. With locations all over the city and beyond, grab yourself a couple of slices as the first one you buy will likely be gone before your visit to Vancouver is over! An Inukshuk is a figure made of mild stones or boulders used as a form of communication throughout Canada’s Arctic. They were traditionally constructed by the Inuit and have become intertwined with representations of Canada. In the Arctic, they are used for practical reasons, such as navigational aids, coordination points and message centers. They have also been known to be used for spiritual means and were the main logo for the 2010 Olympic Games that were held in Vancouver and Whistler! While an authentic Cowichan sweater is not one of the cheap things to buy in Vancouver, it is a unique and authentic Canadian gift that originated in British Columbia. Made by the Coast Salish peoples, these bulky weight yarn sweaters are nationally and culturally significant in Canada and the Coast Salish people have been knitting them since the 19th century. While you can find knock offs by many designers, there are plenty of authentic shops in the Vancouver area to bring your own Vancouver souvenir home! Part of traveling in Vancouver is looking out for the best souvenirs and gifts to bring back from your trip! 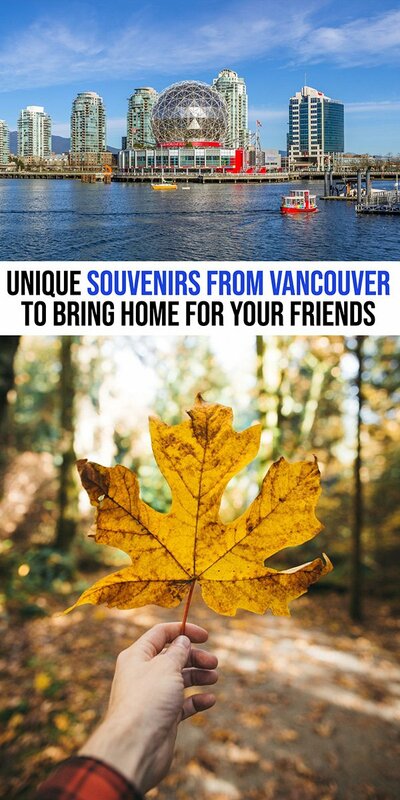 After reading this guide, I hope you have a few ideas of the best places to buy Vancouver souvenirs; whether from local artisans to duty free shopping at the airport! But trying to narrow down what to buy in Vancouver (and what will fit into your suitcase) can be part of the challenge (and the fun). Visiting other parts of Canada? Looking for something “Canadian”? 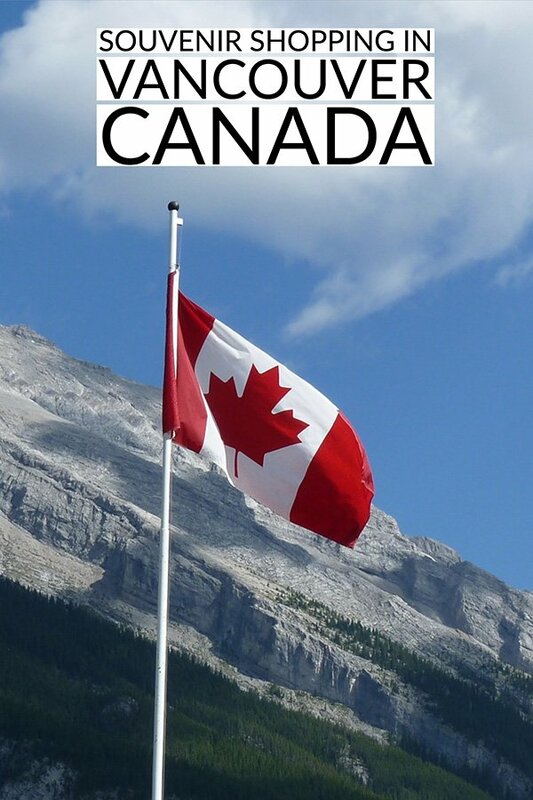 Check out What to Buy in Canada for Souvenirs for some more ideas! You can see my other posts on souvenir shopping here.